Reflective Arrow Custom Sign - - directional arrow shape business signage for outdoor or indoor use. White or yellow reflective background provides high visibility. 10" x 4". Made in USA. 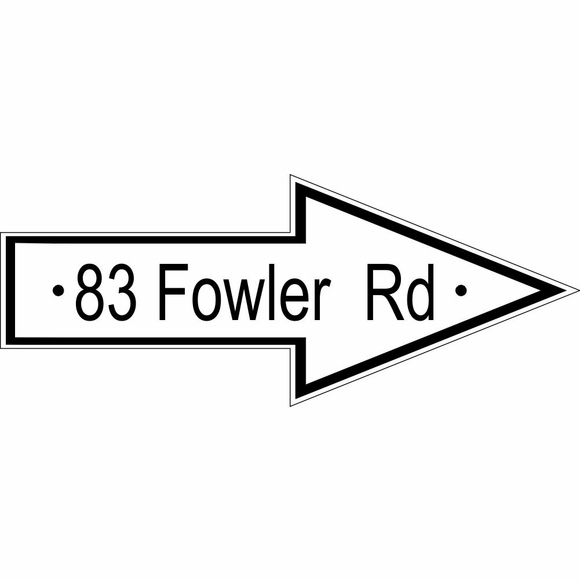 The perfect solution when you need an address sign with an arrow pointing right or left to a particular house number. Fast turnaround; ships in 3 days. Ready for wall mount or lawn mount when paired with the optional Comfort House Lawn stake (see item # CGS24001). Arrow can point to the left or to the right. All three sample arrows are pointing to the right. Available as a blank arrow (no wording) or with one line of the personalization you specify, for example, an address number and street name, This Way Out, Boiler Room, Exit, Restroom, Deliveries, AED This Way. Personalized arrow holds up to twelve (12) 1" mixed upper- and lower-case characters as shown. Note: the style number you see on the sample arrows is for internal use only and is not engraved on your custom sign. Character count includes all spaces and punctuation. Dimensions: 10"W x 4"H x 3/32".